Starting November 5, 2018, email the Program Coordinator and include up to 2 preferred dates and 2 alternate dates (see season schedule) you would like to participate. Include in the email the participant's name, age, and disability. An email will be sent to participants by December 1, 2018 confirming the date(s) SEWASP was able to schedule your lesson(s). This email will include further details to secure your lesson dates and necessary paperwork to complete. If you do not receive an email by December 1, 2018, please contact SEWASP. Lesson requests are granted based on the appropriate equipment and trained volunteers being available. Completed registration forms and payment are due (received by SEWASP) December 17, 2018. Lesson fee is $20.00/lesson. All payments must be made payable to “SEWASP”. The confirmation email will provide details of where to send completed paperwork and payment. Lesson fees must be pre-paid and are non-refundable. For cancelled lessons that are not rescheduled by SEWASP, a letter acknowledging a tax deductible donation will be issued (upon request) at the end of our season. When we receive your payment and paperwork, you will receive an email confirming. During the season you will receive an email a few days prior to your scheduled lesson reminding you of what to bring, where to go, etc. Participants are expected to come to lessons prepared with appropriate winter attire for skiing/snowboarding. If you are not on our mailing list, contact us to be added, and make sure to include a mailing address and phone number (please note that our mailing address and phone number have changed last season). Note: Saturday lessons are priority scheduled for children under the age of 10, people traveling more than 2 hours, people with special needs that prevent them from skiing on Thursday evenings. We do not offer adaptive snowboarding on Saturdays. 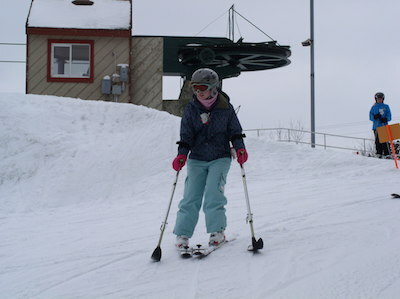 Alpine Valley Ski Area (near East Troy, WI) Dates for Saturday mornings 9:00am-noon (adaptive SKIING only. Sorry, we cannot provide snowboarding lessons Saturday mornings). Priority scheduled for children under the age of 10, people traveling more than 2 hours, people with special needs that prevent them from skiing on Thursdays. Skiers granted a lesson on Saturday will be given ONE date.